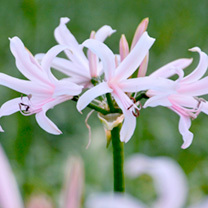 A cross between an amaryllis and a nerine, combining the best of both! Magnificent perennials that will light up your garden each autumn, just as summer bedding starts to fade. The frost-hardy plants bear up to 10 blooms on every stem! Flowers September-November. Height 40-50cm (16-20”). Emanuelle - white. Plant shallowly with their neck just above the surface of the soil at 10-15cm intervals from March onwards. They are happiest in a dense clump, so once planted avoid disturbing the roots and only lift and divide them when they have outgrown their alloted space.